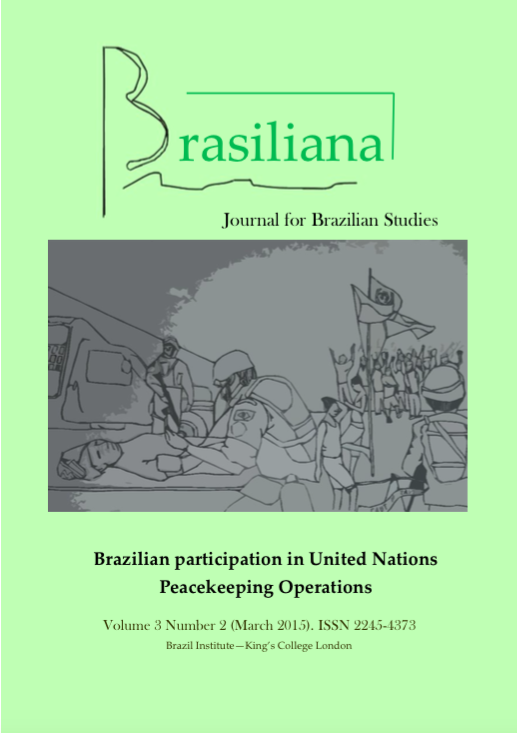 This issue of Brasiliana takes a critical look at Brazil's engagement in UNPKO missions, bringing together papers on a variety of subjects, such as: Brazilian participation in PKO (both from a military and a diplomatic point of view); internal repercussions of external military engagements; effectiveness and consequences of this Brazilian participation in UNPKO (also regarding international relations); papers that critically relate the Brazilian participation in UNPKO to the internal public security policy in Brazil; and finally, articles that discuss and evaluate whether there is a Brazilian way of carrying out peacekeeping operations. Brazil's Rendition of the 'Responsibility to Protect' Doctrine: Promising or Stillborn Diplomatic Proposal? A Diplomacia Brasileira no Conselho de Segurança da ONU: discussões políticas sobre as operações de paz da ONU no Estado haitiano. Land Regularisation in Vidigal, Rio de Janeiro - Was de Soto right? Nielsen, Maria. Resenha: Rights of Way to Brasília Teimosa. The Politics of Squatter Settelment. Marques, Wilton José. O poeta do lá. São Carlos: EdUFSCar, 2014.
Review: Sotomayor, A. C. The Myth of the Democratic Peacekeeper. Civil-Military Relations and the United Nations.